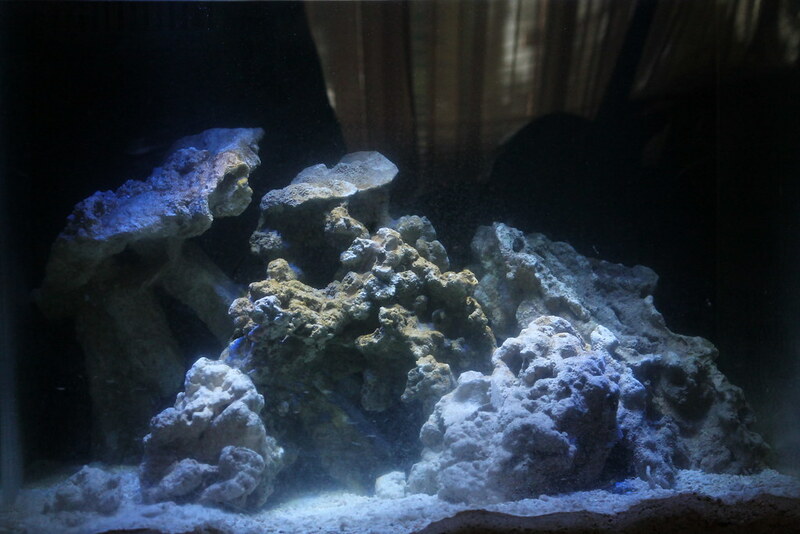 20 Gallon AIO Cube "Humble Beginning"
Discussion in 'Tank Journals' started by Baykes, Apr 19, 2015. Hey everyone, this is going to be my first tank, at least reef tank that is. So a little intro, I am currently finishing up high school, and have actually had a freshwater planted setup since early middle school. I have always dreamed of having a saltwater tank with all of those glowing colors from the corals and fish, and now I get to make it a reality . I am currently cycling my tank, which is a 20 gallon AIO TruVu aquarium that I got as a gift from a friend. He had also given me some live rock and live sand, but unfortunately the rock was out of water for almost a week and is presumably "dead rock" now. For my light, I have an LED fixture that I got from someone on another forum. It is has 10 white 3w cree LEDs and 10 Blue 3 cree LEDs, both sides being dimmable. Right now it has been cycling for about a week, I filled it in on Saturday 4/12/15. I am not in any rush to stock it but I do have a few questions. Please feel free to let me know if I am doing something wrong, I am doing this tank and thread as a learning experience. Currently I have been "ghost-feeding", but I have also heard people using a "prawn" method as well as a fish in method. Since I have yet to get a test kit, I feel the "fish-in" should be ruled out, so should I continue ghost feeding and/or go get a prawn? 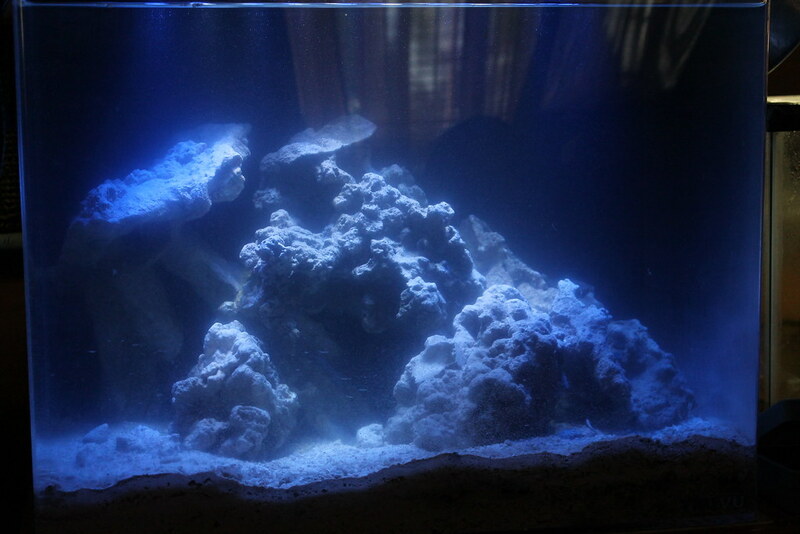 So this is my first AIO, saltwater or freshwater.My question is, should I put any media in these chambers? I have heard mixed opinions, so I was wondering if anyone with a similar setup can chime in. 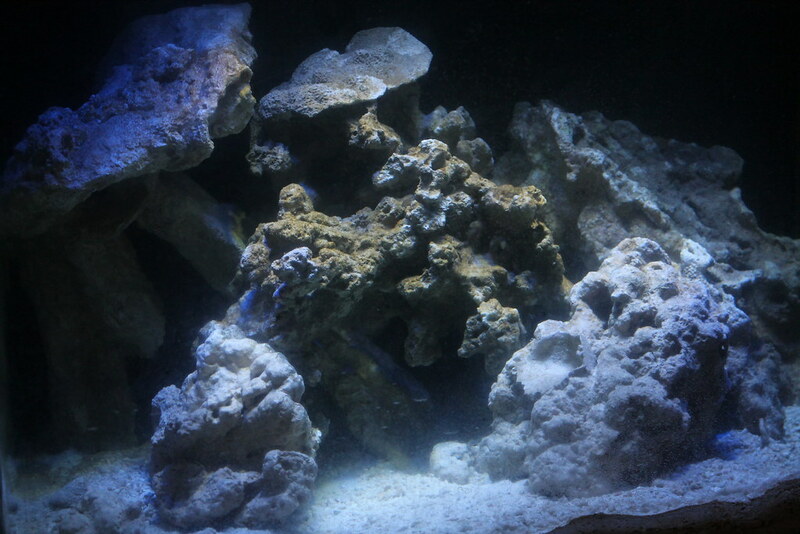 Here is a picture of the tank, I just rearranged the rock and want to ad another on the left hand side, but feedback would be great. Thanks in advance for all of the help! Haha well the main reason I want to put him in is because I want him to be my first test fish, since they are apparently so hardy. I would of course wait till the tank is fully cycled before I put any fish in so should I not worry about getting a "test fish" and if so which on the list should I add first? I posted this list on another forum, and someone was very concerned about the clownfish pair since they felt they would become too aggressive. Is this a valid concern? Going to be honest with you those damsels are MEAN fish. Most of them are very aggressive especially the blue and yellow tail ones. I was watching a BIG 4-inch long plump Six-line Wrasse (which are suppose to be pretty aggressive too) swim past this cave that a yellow tail damsel (1.5 inches long) had claimed his territory. The small damsel swam out and ripped a piece of the wrasse's fin off. The green/yellow tail piece fell to the sand bed and the wrasse swam away. To answer your question, I think the clownfish pair and the shrimp goby pair will be fine. These are fish with very different body sizes/types occupying different areas of the tank. Rule of thumb is if the fish are similar size/shape/swimming areas but different species, trouble is more likely to arise than otherwise. As for media in the chamber, my girlfriend ahruk's tank has no media in the back chamber. Would media help her tank? I think so. It would reduce the amount of water changes we do (usually 20% every two weeks or more).There's literally 2 pieces of rock it's been up for almost 9 months and it's looking great right now. We had an inevitable hair algae outbreak but water changes and turbo snails have kept the tank spotless. But to answer your question. I think if you're still cycling your tank. Dont use media. Once you get the hang of things, throw some media in there after you understand reef tank chemistry and how they change. 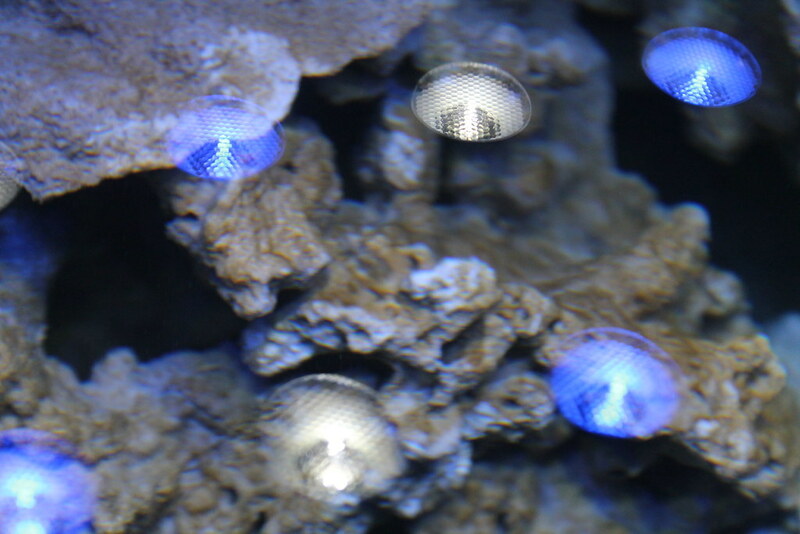 Media is there to help make your aquarium maintenance easier. It's not a requirement. Clownfish are pretty easy beginners fish. If you watch all your parameters and make sure your tank is cycled/stable you'll be fine. Don't worry about getting a damsel or chromis as a test fish. I cycled my tank by dropping in fish food. Some people throw in a whole raw shrimp but I think that's unnecessary. I also recommend boosting your cycling period by using bottled Bacteria. When I first started, I read all the articles in the Newbies section on Reef Central and then any questions I had left I just asked everyone (BAR people, Local Fish Store people, Reefcentral and other forums). Welcome to the club again! And let us know if you need any help. We have knowledge and even equipment that we lend out sometimes Usually people post questions in their tank journal and everyone else chimes in and tries to help. Thanks for all the replies. I like the maroons but am staying away from them because of their temperament and potential size. So I will probably stay away from the damsel, I had no idea that they were that aggressive! Enderturtle - You said that the clowns and shrimp/goby will be good together, but will that fire fish work as well? Also, which bacteria boost do you recommend. I am just worried about using the stuff since some seem to think that a "natural" cycle works better. Ahruk - Sorry about your first fish but I am glad your second one worked a lot better! They are cool fish, but would they be ok in the same tank as a shrimp goby pair? Also, thanks all for the responses! I have seriously got more replies here than on the public forums such as reef central and the likes. If you do keep a firefish and a pistol shrimp together, make sure the firefish has places to hide. My friend had a 50 gallon cube with 5 firefish 2 clownfish, 1 sixline wrasse, 1 yellow watchman goby. He added a pistol shrimp and the watchman goby paired up with the shrimp. Keep in mind he didn't have ANY live rock in the display tank, but his sump. So the firefish had no hiding spots. We think the firefish tried living in the shrimp burrow and the pistol shrimp only let the watchman goby in. All was good and neat until one day he woke up and saw ALL 5 firefish dead in front of the pistol shrimp burrow with the characteristic burn marks. The sixline wrasse also later died from the pistol shrimp. After hearing that, I never wanted a pistol shrimp for my tank. Is this for sure going to happen in your tank? I don't know. I mean if the fire fish has a spot to claim its home in the tank, it should be fine, but this is a 20 gallon tank. As for bacteria, I recommend Brightwell Microbacter7. Here's a thread on peoples favorite bacteria products. 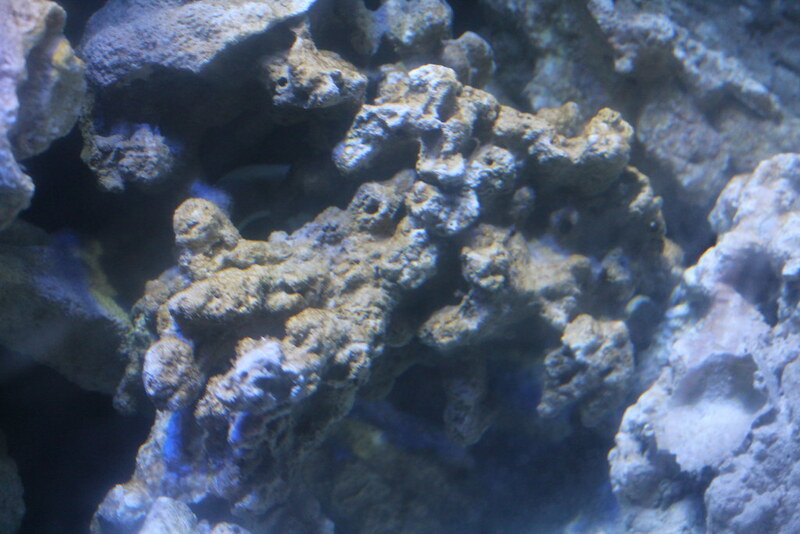 http://www.reefcentral.com/forums/showthread.php?t=1962740 For my tank I used Biospira from Instant Ocean. Wow! I really do NOT want that to happen to my tank! I will definitely keep this in mind. Do you happen to know the kind of pistol? I heard Randall's are supposed to be more peaceful than others such as the tiger pistol shrimp. Thanks for the input! I think I am starting to get algae? 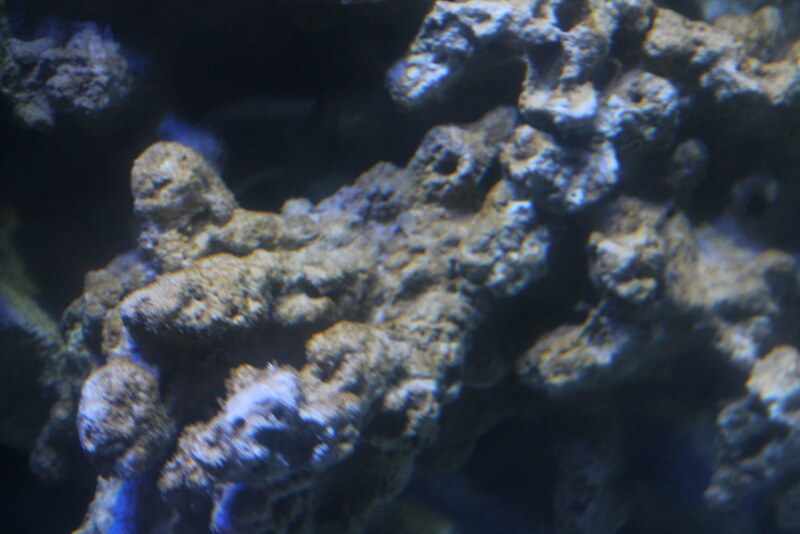 I have this brownish sunstance growing on my rocks and I am assuming this is algae?If so do I keep turning on my lights to grow it so my CUC has something to eat when I introduce them, or turn off them to kill it? Either way I am oddly excited that something is happening ! Yay I have algae !!! Take a picture of the algae if you can. It's probably diatoms but pictures will help. Does its look like brown spots/patches on the sand? If it is slimey and red, it's cyanobacteria. If it's hairy looking probably hair algae. But these descriptions are subjective. Keep your lights on and let your CUC do their job. Do your normal water changes. You'll probably see an explosion of copepods soon. It's fun seeing these tanks progress and your progression will probably be similar to most peoples. Thanks for the advice! After setting up several FW tanks it is really nice to enjoy the wonder of watching something entirely new progress! 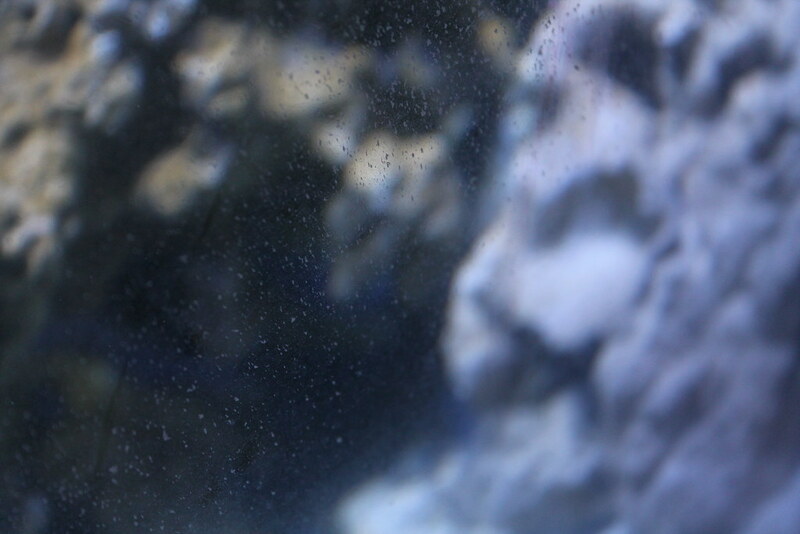 Also there is these little speck on the acrylic, is it algae that I shouldleave or dust I should clean? Also one more quick question, someone had told me to keep the water low in the larger back chamber. The problem is that it is kind of loud. Would it be ok to raise the water in the back chamber or is their an important reason to keep it low? 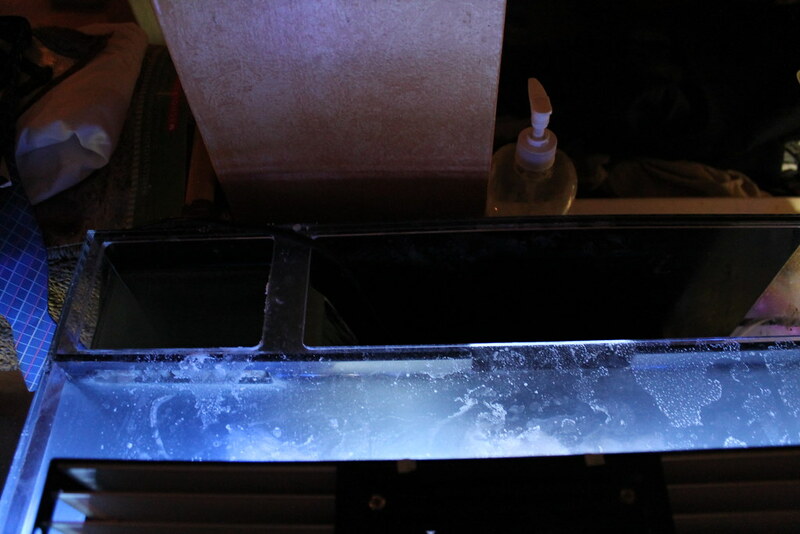 Since this is an AIO (All in one) tank, the back area is like your sump. To my knowledge, there is no reason to keep the water level back there low. Keep it at where it's suppose to be. But I'm confused as to why it is loud? There shouldn't be a noise. Take a picture of the back chambers if you want. Usually with tanks that have an overflow pipe/box connecting to the sump tank below, the pipe is at or trying to be under vacuum and may "slurp" water. But I dont think this is the case here since you don't have a dedicated sump tank connected to your main tank. Also your tank is still cycling, you have measurable ammonia and nitrites. I wouldn't have added the clean-up-crew until after it was done cycling. But since they're already in there you're fine. Watch to see if they die though. If they're dead take them out. You have a diatom bloom (the brown stuff on the glass and rocks). This is normal. It will go away soon. Yes I definitely agree about the CUC! Sorry if I wasn't clear but I was talking about letting the algae grow out for when I introduce the CUC and I have not actually introduced them yet. The only living thing in my tank are diotoms . Also it was loud because as the water overflowed from the first chamber to the water of the second one, which was like 10 inches down, it made a lot of noise. Now since there is less difference in water level it is much more quiet! Thanks for the help! Alright so I increased the water level in the back and sooo much quieter . So I did another test today, did not get a chance during the weekend, and I was pleasantly surprised by the results! So I am thinking about putting in the CUC on Friday or Saturday, what do you guys think? Add some fish food and test again on friday. If no nitrite/ammonia spike. Then add one or two snails/hermits. Avoid the giant turbo snails for now. Wow thanks for the quick reply! Ok will add food today, probably as much as I would expect to feed a couple of fishes? Also should I expect to see a spike tomorrow or later today if there would be one? The idea behind all this is to culture enough beneficial bacteria to be able to easily handle the amount of ammonia that will come from your set of clean-up-crew. Your test results will tell you when you can add CUC/fish. Anytime you add too many fish at once this early in your tank's life, you risk overloading your bacteria's ability to convert ammonia/nitrite to nitrate. I would just sprinkle a pinch of food every other day. Did you ever add bacteria from a bottle? 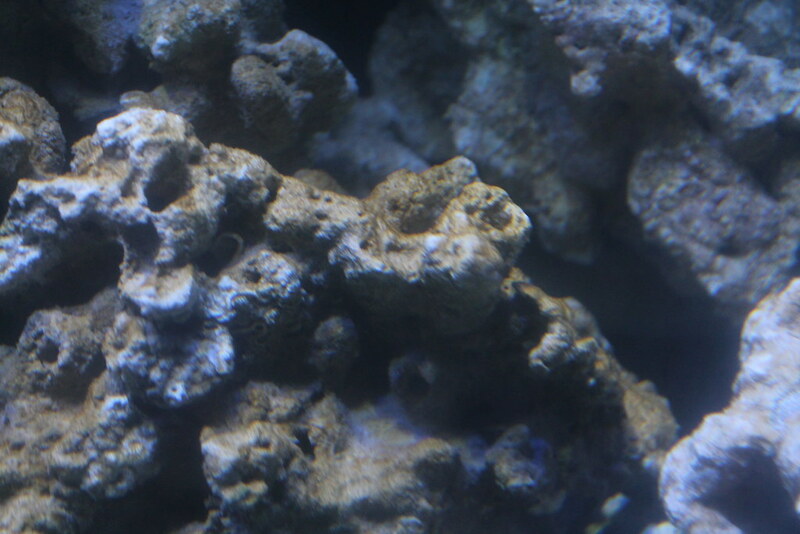 If this rock came wet from another person's established tank, there should already be some beneficial bacteria in your tank. If it was left to dry, then all you have is dead stuff. Yeah the rocks I had gotten were live but it took like 5 days before I put them into the tank. The rock was only slightly moist and I am sure that the stuff was dead. However I had also gotten live sand from a friends established tank, and this was kept nice and wet, so should there be some bacteria? I have not added any bacteria in a bottle, but if the ammonia and nitrites were high, I am assuming this was from the fish food that I had added and everything on the rock that had died, and has gotten low again that means there must be some bacteria right? Would my tank still benefit if I added some of the liquid bacteria? Thanks again for the help!